The horizontal trays hang from a rail or stand alone to horizontally store letter-or legal-size papers. It has 4 integrated feet on the bottom of the tray for standing on a surface or stacking vertically. They measure 10″ or 16″: wide by 12 1/4″ deep and 3 1/4″ tall. 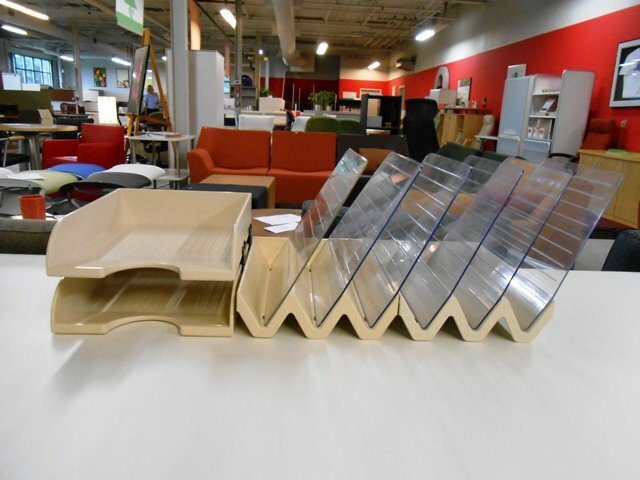 The diagonal trays can also hang for a rail or stand along to store papers and folders. It has 3 transparent dividers that move to support left-or right-handed activities. They measure 13 1/4″ wide by 12 1/8″ deep by 10 1/8″ tall.